Airline agent: You have connected flight. Make sure your luggage is on a plane at your connection. Airline Passenger: How can I do it? *) the baffled airline passenger – yours truly, the airport – Chicago O’Hare, the airline – let’s just say their color is blue, the luggage – successfully got to the final destination. I get butterflies in my stomach every time we drop our bags at a check-in counter. Would they be reunited with us on the other side? Or would they be sitting in Bangkok while we would be landing in London? Seemingly every seasoned traveler has horror stories of lost luggage. According to Baggage Report 2015 by SITA, the rate of bag mishandling in 2014 was 7.3 bags per thousand passengers (or 24.1million mishandled (lost and temporarily mislaid) bags). Comparing to 18.9 bags per thousand in 2007, it is a marked improvement. Unfortunately, the problem still exists. Statistically, if you fly often enough sooner or later, you would face it. In the past 2 years, we had 3 close calls when our bags were lost or delayed on arrival but eventually were recovered and returned to us. Great outcome. All 3 cases happened in non-English speaking countries. Airport staff dealing with mishandled luggage had various levels of English proficiency, but neither of them spoke the language fluently. Naturally, we had to describe our lost bags. It was surprisingly difficult. Metric system vs. imperial one. Unfamiliar luggage brand names (in Sicily they even had a thick photo album full of pictures of various luggage logos and pictures of bags, but neither matched ours). Even describing colors was not straightforward. Looking back at our ordeals, I came up with an idea that would simplify communications with airport officials. A luggage selfie. Ok, I am using a buzzword to gain attention. I recommend taking a photo of your bag(s) the way it looks right before it leaves at the check-in counter at the airport. If it has any easily noticeable features (displays band name, any marks or imperfections), take a photo that includes them too. Of course, taking a luggage photo wouldn’t protect your bag from been lost, but I can guarantee that it would make your communication with foreign airport officials more efficient. In Europe, if you travel from outside of Schengen zone (for example, from Cyprus to Italy or Bulgaria to Spain), at some airports your luggage would be delivered to a separate dedicated luggage claim location. In our experience outside of the US, we never talked to an airline about our mishandled luggage. It was always some 3rd party contracting company that was handling luggage at a particular airport. 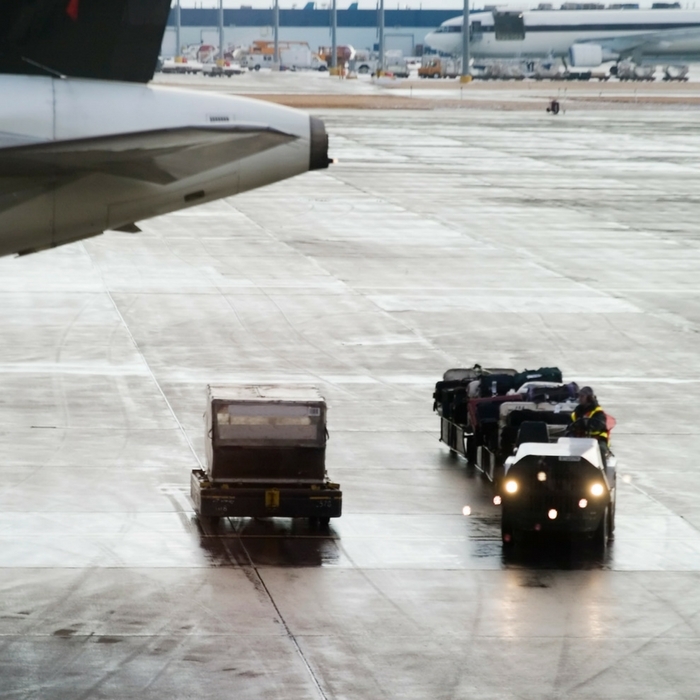 Lost luggage is a worst traveler’s nightmare. Take a photo of your luggage. It would easy your communication with lost luggage handlers at foreign airports. I always fear losing luggage! And those stats are kind of scary. This is a great tip! What a great idea taking a photo of your luggage. We travel with our three children so having to remember 5 suitcases is so much fun. Everytime we travel our luggage gets lost too. We had to go back to the US last summer since my husband’s father passed away. United lost our luggage for 4 days. We spent $600 replacing things and we were never refunded. Thankfully we did get our luggage back. Having bad connections international to domestic is a good way to lose your luggage. So always have ample time for you to get through customs and security to recheck your luggage. This is an amazing idea, touchwood I’ve never experienced lost luggage till date, but I will definitely keep this in mind to be safe. Why have I not been doing this before!? Luggage selfie is the best! I’m totally going to use this tip for the future  smart! Luggage Selfie – this is a great idea. I wish I had this idea last year when my backpack traveled all the way from Bali to Kuala Lumpur to Shanghai to Beijing before finally finding me in Singapore. I get so anxious every time I need to check in bags. Usually, whenever possible, I just bring hand luggage with me. I’ve got my suitcases lost a couple of times before and it’s just awful, especially when you arrive to a foreign country with no clothes! It’s so scary when you’re taking a connected flight! I’m always afraid they will lost my luggages, and then I will have no idea how to do! Thanks for all the tips! I only once had a piece of luggage go missing, and as sad as that was, I was openly able to assign pretty much any value to the contents of the luggage. I got a huge check in return for the lost luggage. There were mostly replaceable items lost, but it was nice to get the bonus check. And twice I have had luggage just slightly damaged but I reported it to be check, both times I got checks for enough money to replace the luggage completely. I would prefer to just get my stuff to the destination, but I have felt pretty good about how these incidents have been handled. Thank you, Judson :). I like stories with happy endings! I should give this idea of a Luggage selfie to my husband. He has had the misfortune of losing his bags at least twice and had to buy new clothes before he got his bags back. It really drains your dollars . I too, get a little jittery when i drop off the bags but one lesson I have learnt from my hubby’s experience is to keep your valuables and a spare set of clothes with you in your hand bag. a great idea and very interesting, it might be very useful when traveling. This is not only a good idea, but i also think you should unzip the bag, open it wide, and take a shot of the packed items lying inside. If you bag is truly lost, this can help you claim a dollar value from the airline. This is great advice! I have been blessed that on each trip I’ve done my luggage has arrived, but it is always a good idea to take precautions! thanks for sharing this! Ahh, my biggest nightmare is definitely losing my luggage! Thanks for sharing this, I think it’s super important to take a photo of your luggage (it’s what I always do) just to plan for the worst! Interesting post! I hate checking in my luggage and will carry on every chance I get. Good idea with taking photos of your luggage. My luggage got lost in Bangkok, luckily I got it 48 hours later. Very good idea!! But beware that you can get some money refund in case of delayed luggage (with the European airlines at least) to allow you to buy some urgent staff e.g. underwear, a change, toothpaste, toothbrush and makeup (for ladies). This is a really good idea! I only had my luggage mishandled once. I was going from NYC to Dublin with a layover in Paris and they didn’t put it on the correct flight in Paris! Fortunately I got the right suitcase later that evening. I am lucky that my suitcase has bright pink flowers so it’s pretty unusual, but a photo would help if I’m in a country where I don’t speak the language. This is interesting. I have never put much thought about luggage ever. When i travel it about packing light, keeping some food with me and thats it! The main part is the place and the photographs. This is a new perspective altogether. I am suddenly scared what if I loose my luggage. Great idea to have it photographed before leaving at counter. Oh, the horrors of the airline loosing your bag! I have been through such a nightmare last Christmas, when I left for Cuba but the airline decided to leave my bag at home… and then travel it around the world until they lost it. I got it back after a month! I do recommend to take a selfie with the luggage and with the contents also. Sometimes the tag breaks and the only way your bag will be identified will be on its contents. Such a informative post. Luckily I never lost my luggage hope I won’t in future. Thanks for nice post. That was a great idea about the selfie. We have never had any lost luggage but we were delayed for 6 hours so it would be past midnight in Beijing. Doing because we had to be out of China in 24 hours and waiting past midnight put us into a new day. Luggage got sent to storage was hard to find. I’ll follow your tip and take the picture of my baggage before dropping it at the check in counter! I ran into the benefits of the luggage selfie quite by accident. I was taking a picture of my brand new luggage at the airport to send to a friend. 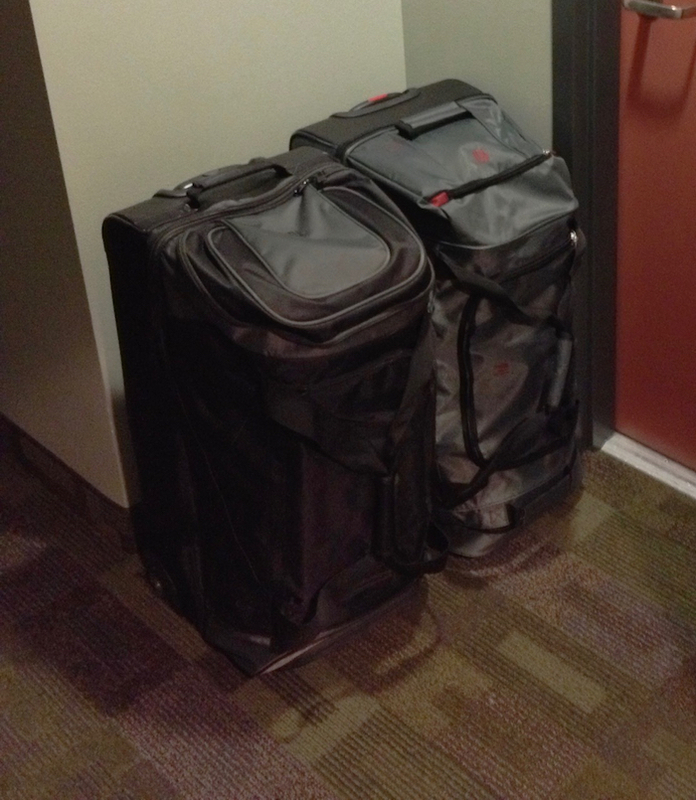 Then viola, 15 hrous later…the luggage didn’t arrive. It was so helpful to have the picture that I have done it ever since. Thankfully, I have not needed it though since then. 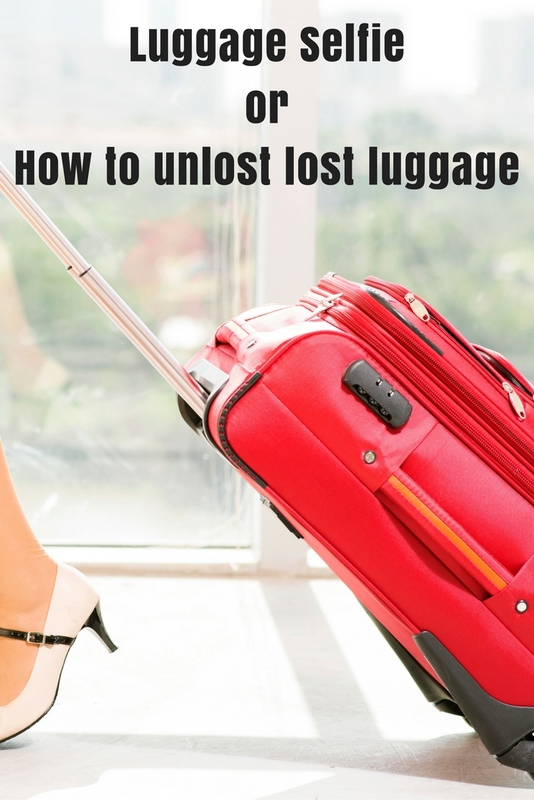 Losing your luggage is every traveller’s nightmare especially if you have connecting flights. Thanks for the tip about the pic.Since my luggage is sponsored I have to take a pic before I travel so I have loads of pics of my pink luggage. I wonder if color matters  Does pink (or any bright colored) luggage gets lost less? Thanks for the suggestion! Never thought about including the traveler in the photo! What a great idea! I like the idea of including the traveler in the photo so it’s easy to prove who you are later, too.